Finding a furniture store in Columbus, Ohio is not that difficult a task. After all, there are hundreds of different options for choosing the furniture that you need, no matter what room of the house you are shopping for. Whether you need casual furniture for your kitchen or breakfast nook or more traditional dining room furniture, you can find exactly what you need at the Amish Original Furniture Co., featuring the area’s best and biggest selection of handmade, all natural, Amish furniture. To meet your needs, we bring the best of Amish craftsmanship to you for all of your furniture needs. We utilize the services of more than 70 traditional, Amish families throughout the Ohio area and then bring them to our furniture store in Columbus, Ohio so that you can find wood furniture in one convenient location. To see this many different Amish built pieces otherwise, you would have to drive around to different communities, often into hard to navigate areas that are cut off from modern amenities such as gas stations and cell phone towers. You may be unaware of this, but many of the Amish will not sell their furniture or other wares to you directly because it is against their traditions and the laws of their community. Why drive for hours, risking the dangers of getting lost, running out of gas and having no way to call for help only to find out that you cannot buy the furniture that you want once you get there? 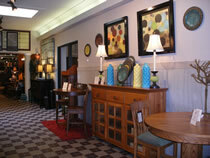 Instead, you can shop for your furniture choices here at Amish Original Furniture Co, located in the Columbus area. Quality – Amish furniture is handmade using real hard woods and centuries old traditions that have been handed down from generation to generation. Durability – Wood furniture that has been created from real hardwood is longer lasting than particle board, compressed wood or manufactured wood furniture items. Appearance – You can choose the right stain colors and the strain of wood that you want your furniture to be built from, which gives you more options to get the furniture of your dreams. Buy Local – Locally created furniture means that the local economy is being supported with every purchase that you make. In addition to getting the old world charm of real Amish furniture, you get the modern day conveniences of online shopping, delivery to your home and more. If you were going to shop for Amish furniture at other locations, you would have to wait until shops are open. Smaller shops are typically open for very short hours and may have very limited selections available. That may drive the cost for their furniture items higher. At Amish Original Furniture Co., not only will you get the perfect furniture, but you can get it without having to drive for hours.